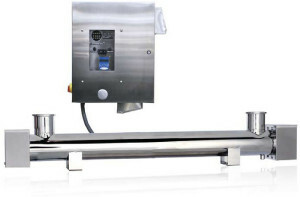 Aquafine’s LS HX Series systems is manufactured for the disinfection of syrups, including simple syrups, syrup mixes and high-fructose corn syrups. With low-pressure high output lamps (LPHO) technology, the HX lamp provides increased process performance and extended lamp life, while the systems compact size allows for a smaller footprint, maximizing installations flexibility. Single-ended (SE) HX lamps allow quick change-outs without tools. The LS HX™series consists of 316L stainless steel treatment chamber with sanitary connections and a standard stainless steel control cabinet, with a maximum cable length of 15ft. (5m). The control cabinet features the UV & Temperature Monitoring System for 12 lamp models or UVG400 controller for 24 and 36 lamp models.